NYE in NYC is known amongst club owners/promoters as amateur night, a night of ripped off all inclusive deals, drunkin debauchery, served with a side of nonsense. Sorry to sound bitter, but if your coming into NYE in NYC without knowledge of the club/bar scene you can either have the worst or best night of your life. 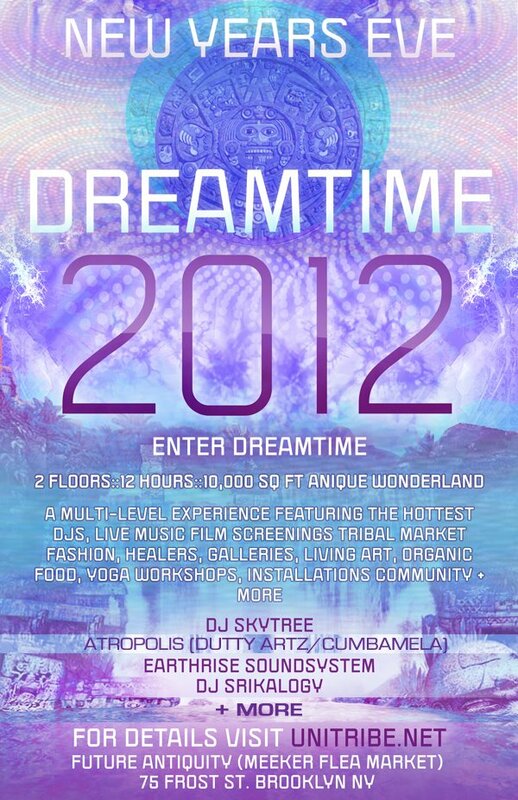 That said, I am super excited and thankful to have been invited to perform at Dreamtime 2012; an underground warehouse event curated by friends and circling bodies of communities I’ve performed with/for throughout the years. This event is the meeting ground for music, fashion, healers, art galleries, organic catered food, yoga, workshops, installationsfilm screenings and more. It will take place throughout a 2 floor/10,000 sq ft warehouse located in Williamsburg, at 75 Frost Street (Walking distance from the Bedford L stop). You can purchase tickets here. For me, it is events like these that really speak to me when thinking what New York has to offer to artists, performers, and creative thinkers. NYC artistic landscape is constantly evolving and shifting throughout the boroughs and at times NYC seems to have lost its edge due to stricter policies enforced over the past 20 years. I do feel that NYC has choked the performance space to death with rules and regulations, which has lead to underground warehouse events hosted by courageous individuals and groups of people that are willing to invest and possibly loose a few bucks if the 5-0 comes to break up the fun. So if you are in search of something fresh, exciting and innovative; and you are looking to experience an event bought to you by local artists of all crafts, this is the place to be on New Years. The folks responsible for this event are Unitribe, Get Your Dance On, Evolver, Beyond Kombucha, City Life Wellness, and more.